The Canon EF 28-90mm f/4-5.6 II USM Lens is another of Canon's econo normal zoom lenses. It is very cheap - in cost, in build quality and in optical results. Starting with a plastic mount, the Canon EF 28-90mm f/4-5.6 II USM Lens cuts a lot of corners. Of course, this corner-cutting results in a very cheap price tag. 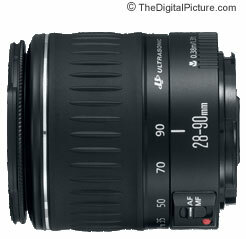 It also results in a small and light package - even lighter than the Canon EF 28-80mm II Lens. Most of the other goodies are also missing including a distance window. Although it sports "USM" (Ultrasonic Motor) in its moniker, the Canon EF 28-90mm f/4-5.6 II USM Lens utilizes the lesser Micro-USM - not Canon's superb Ring-USM. The 28-90 USM does focus quickly and quietly. It does not provide FTM (Full Time Manual) focusing. 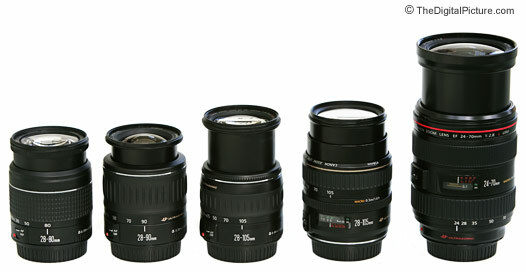 In fact, the tiny MF (Manual Focus) ring is difficult to use and is located on the extending portion of the lens barrel. Utilizing a 5-blade (lower end) aperture, the 28-90 II is a slow lens starting with an aperture of f/4, going to f/4.5 around 40mm, f/5 near 60mm, and to f/5.6 around 73mm. The 28-90 II is sharper at the wide end rapidly progressing to soft at 90mm. Wide open sharpness is not bad at 28mm, but the corners are soft until the lens is stopped down to f/8. The 28-90 II is very soft wide open over most of the balance of the focal length range. Even on a 1.3x FOVCF body, distortion is noticeable. Barrel distortion at 28mm is corrected by 40mm. Pincushion distortion is present at 90mm. Vignetting seems to be well-controlled, but flare is a problem on the Canon EF 28-90mm f/4-5.6 II USM Lens. The 28-90 II has a focal length range that falls within the normal, general purpose zoom range. Once again, I recommend, if possible, purchasing one of the lenses suggested on the Canon General Purpose Lens Recommendations page.